Catch by Northmate is an interactive feeder for cats, designed to stimulate their natural instincts and ability to catch food with their paws. 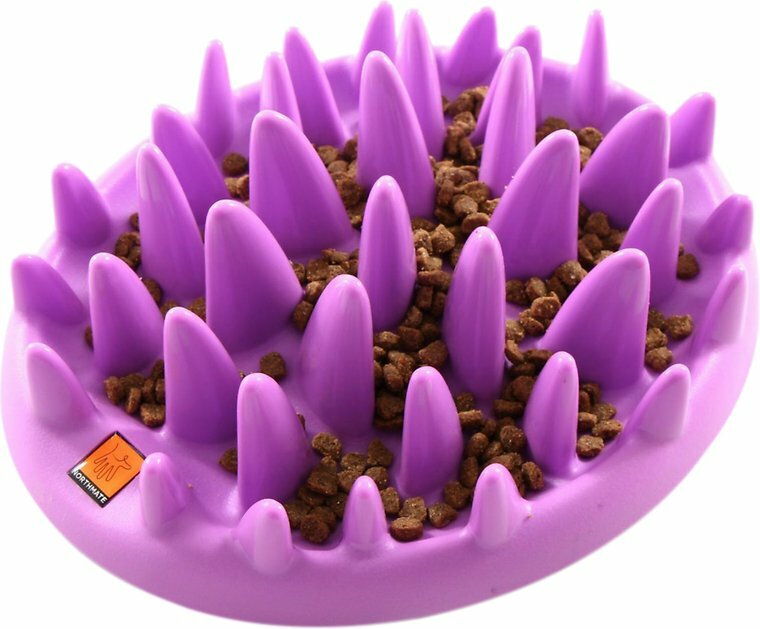 The desired amount of cat food is scattered across Catch, and it is up to your cat to push and grab the food out between the many smoothly-rounded spikes. Catch by Northmate prolongs eating time significantly. This results in a happier and healthier cat. One size, designed for all breeds of cats. Stimulates your cat’s instincts and help to significantly prolong your cat's eating time. Four anti-slippery feet to keep feeder secure. Made of hard phthalate-free plastic suitable for indoor and outdoor use. The dish is sturdy, but only my youngest, hyperactive cat showed any interest -- which soon came to an end. My overweight cat kept looking at the dish and back at me as if I were playing some cruel joke on him. His paws are too big to fit between the protuberances anyway. My third cat banged her face into it a few times, but then gave up when she couldn't just reach the food with her mouth. It's been a resounding failure in my house. The little rubber pads underneath don't seem to help much to keep the dish from being pushed around a smooth surface like tile. My kitten is about 8 months old now, and has issues eating too fast then throwing up his food, so I've been strictly feeding him canned wet food, as it's easier to digest just being scarfed down. With this contraption it lengthens meal times considerable. He would have his food scarfed down in less than a minute, now it takes him about 10 min. He figured it out immediately, and has had no issues feeding himself, or regurgitating. Thank God! 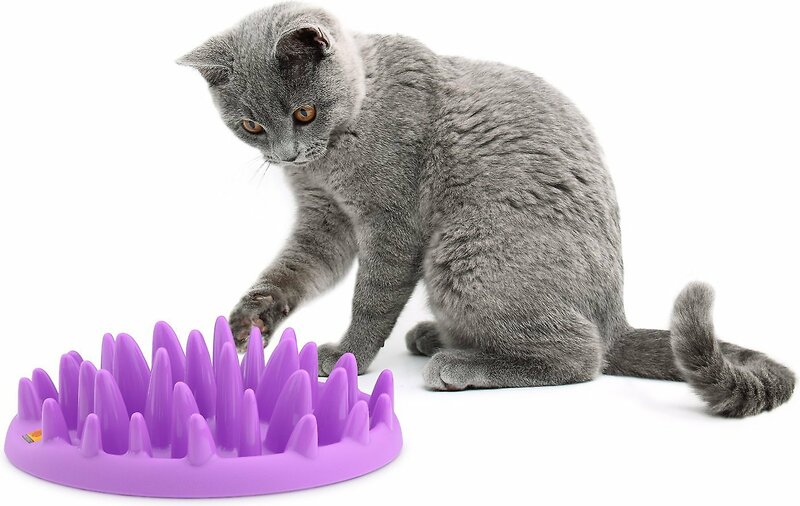 Reading other reviews, if you have a young cat that's eating too fast this could be THE solution, but if your cat is older and stuck in their ways, you might have issues getting them to use this. We have four cats. One of each: Domestic Short Hair, Tabby, Burmese & a Tortie. None of them liked it. It is very hard and easily knocks over causing food to scatter. I was very hopeful as our Domestic eats way to fast causing him to be sick and he didn’t even try hard with this, even for FOOD! Cats give it a thumbs down. I haven't had any problems with this cat dish. My cats are a little slow to learn, (I can say that, I'm their mom!) but they are definitely not gulping down their food as before. As far as losing weight, it's hard to tell, we are still working on getting them to stand still on the bathroom scales. I would recomend this dish. I have two cats. I purchased this because one is extremely overweight. I thought it would help in slowing him down. He refuses to use it and will often tip it over knocking all of the food on the floor. The other cat uses it, but cannot get the food out that is in the middle. There is always food in there. This is the craziest thing I've ever seen. Once my cats have caught on to it -- it is working out fine as a toy for them. It took them awhile to figure it out and they are having a good time with it. I'm sure that my boys were wondering what it was when it appeared. It took them a couple of days to figure it out but they are enjoying "fishing" for their food now. I gave it four stars because it is hard for my Big Guy to get his large paw in the center to get the food and the rubber feet could be better. I had my doubts about this the first two days. My cat is 17 years old and wolfs down the treats that I give her (about 12) every morning in about 10 seconds even though I scatter them around the room. It took her over 30 minutes the first day and had to take to take a break in between. The second day she wouldn't go near it for about 30 minutes and then worked on it off and on until she got them all. Now she goes after it until she gets them all, usually about 15 minutes. Much better than 10 seconds.